Our Nikkalite® protective overlay films protect traffic signs from dew and graffiti to ensure clear messaging for the road user. 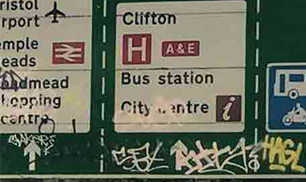 Dew and graffiti on road traffic signs can obscure the sign and be extremely dangerous for motorists concentrating on deciphering the sign and not giving the road their full attention. Our Nikkalite® protective overlay films protect traffic signs from dew and graffiti to ensure clear messaging for the road user. Nikkalite® Dewtect-S is durable transparent self adhesive sheeting with a hydrophilic surface coating which combats dew formation allowing normal retroreflectivity to occur. Nikkalite® EF 40801 is a highly durable graffiti resistant transparent self-adhesive overlay film, which has excellent solvent resistance and chemical resistance, weather ability and dimensional stability. Nikkalite® A100 series transparent coloured overlays are durable cast flexible sheetings, which have excellent dimensional stability and a clear acrylic pressure sensitive adhesive protected by a plastic liner.